Does your team take its deadlines seriously and consistently hit agreed upon goals? Are you working in a culture where missed deadlines are a regular occurrence with no consequences? 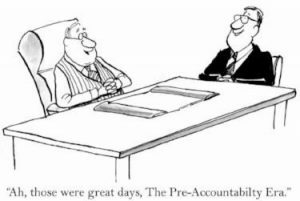 Building an accountable team is indeed a challenge. So far this month, I have written about the “Five Keys to Improving Team Productivity” by addressing the importance of key one, building trust, and key two, deciding what to measure. This week I want to talk about key three, establishing norms. Business unit or team level goals: Do team members know their top three goals for this year, this quarter, and this month? Why are these goals meaningful to our company and team? Individual roles and responsibilities: If I fail to do my job on time or accurately, what is the cost to our team, our customers, and the company?How does my job fit into the overall mission of the team and the company? Who are my internal customers and how can I work effectively with them? Team communication: What standards have been set for communication and reporting? Do we use “dashboard” reporting in Tableau software, an Excel spreadsheet, or a shared Google doc? Do we have ground rules on respectful communication? Processes and standards: Does everyone know the steps for handling a customer complaint? Do we agree upon the best practices for completing client projects? Consequences & Rewards: What happens if we miss a deadline? Do we have a process for addressing and improving performance issues? How will we reward teams and individuals for hitting goals? Looking beyond the areas that require clarity, I can say that most of us begin with good intentions, but things get in the way. Many entrepreneurs resist setting processes because they fear becoming “too corporate”. Others simply hate conflict, and or don’t enjoy the management side of leadership. Whatever the case, there are a few steps that can help. When a deadline is missed, speak privately with the individual and ask what happened. Do they need more training in the software they are expected to use? Are they struggling to prioritize? Ask yourself if you have the right person in the job.